First up was Communion's New Faces tour on Monday at The Bullingdon, a venue I've been running the Twitter for for a couple of months - but I haven't got to a show at the venue since then, so I spent most of the evening chatting to the manager and missed all but Jack Watts' set (which I really enjoyed), but hearing (just not seeing) the rest they all sounded cool which is a given with them having the backing of Communion! 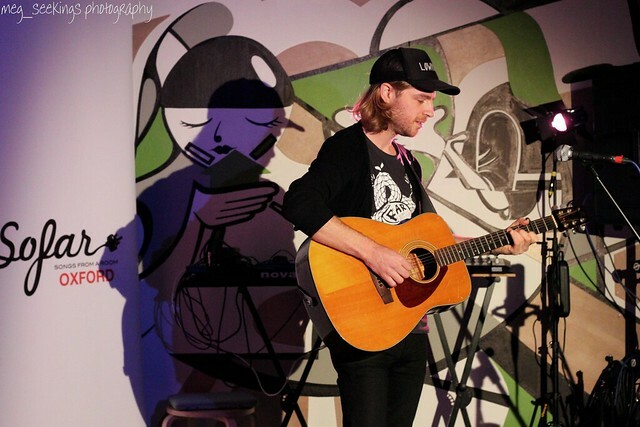 Second up was a Secret Sessions show on Tuesday at The Hospital Club in London, with Big Sixes and King Charles on the line-up. I hadn't listened to Big Sixes before and it struck me the set was a little more stripped back than they usually play but I really enjoyed it, the stage banter was great as were the beautiful harmonies! 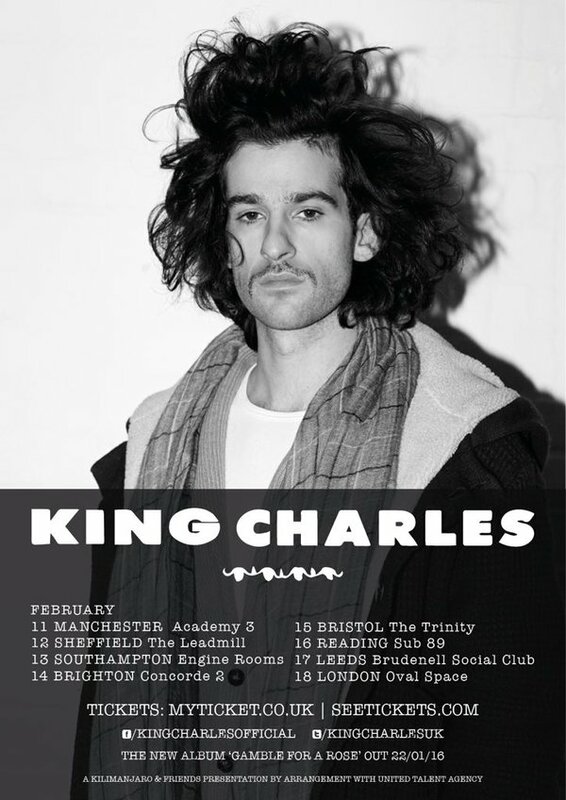 Likewise, as my sixth King Charles set of the year it was the first solo one, with Charles playing predominantly tracks from his upcoming record (out 22nd Jan!) Below is a snippet of Gamble For A Rose, the latest single - lovely to see this performed in this style! 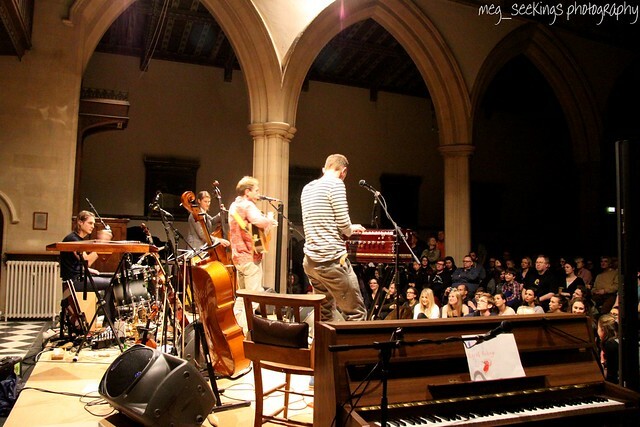 Skip to Thursday, and the lovely Oli from Stornoway got me a photo-pass for the second night of their two shows at St John the Evangelist Church in Oxford, just a 20 min walk from my flat. Opening up their set on the balcony to perform an unplugged version of Josephine, a track from their latest album Bonxie, they set the tone for what was to be a really beautiful evening. Here's one of my photos from the evening, a few more are on my Flickr here. Last up was the ever wonderful Mumford & Sons last night at Capital FM Arena Nottingham. Having only seen them once before at the same venue (but standing that time) it was a little bittersweet to be seated but we had quite a good view and a great view of the stunning light show put on by Mumford's lighting designer Ed Warren. This photo doesn't do the lights justice but there's a gallery of Ed's work on his site here. Jack Garratt was in support, and it was clear that Mumford knew their luck in getting him along for the tour as he's certainly going places, having just been announced as the winner of the Brit Awards Critics Choice, for instance. The band invited him back onstage to play a cover of Eurythmics (which they played on Radio 2 earlier in the year) which I recorded a snippet of - watch that here. Mumford are a favourite band of mine so it was great to see them play live again and to hear most of the tracks from the brilliant third album Wilder Mind, which were accepted by the crowd just as well as the more folk-y tracks of their first two records. An added bonus to their live show is the addition of Noah & The Whale's Tom Hobden, accompanying them with fiddle, guitar and keys for most of the set. His playing during Ghosts That We Knew (below) pretty much had me in tears - so stunning! Having met Tom a few times this year (at far smaller shows! ), it was superb to be able to chat at side of stage for a part of Jack's set about the likes of Mumford, Noah and King Charles - he's a lovely guy and one of my favourite musicians, Mumford are lucky to have him playing alongside them! What a wonderful week of gigs - sadly I don't have any (as of yet) planned for this week as I've got a couple of essays to write and an exam to start revising for. After last night's wonderful show however - I've been all but persuaded to try and get a ticket to Mumford & Sons' show at O2 Arena on 10th December as King Charles is supporting and it'd be incredible to see him play to such a huge crowd! I've posted a couple of sessions from imagesound in the past - particularly partial to their Sam Beeton and Jack Savoretti recordings. Here's a new video with Tom Figgins performing his latest single Giants Played In Woods Like These. I've been lucky to see Tom play solo sets a few times this year as well as seeing him play as part of Matt Owens' post-Noah & The Whale solo project, The Delusional Vanity Project. He's a wonderful live talent and his music is getting the recognition it deserves with a ton of live shows and radio play from the likes of Chris Evans on BBC Radio 2. You can get the Giants single on iTunes here. Got that Monday morning feeling? This should help... beautiful live video of Jack Savoretti filmed live at Sage Gateshead by Ont Sofa. The track, Catapult, is taken from the re-released version of Jack's record Written In Scars, which features this, another new track (Back Where I Belong) and some live tracks. Get the re-release CD on Amazon here and iTunes here. I'm partial to a stripped back song showcasing the vocals and songwriting of the artist, and who better to deliver this than Sam Swallow, one third of a favourite band of mine, The Hoosiers. A long serving touring member of the band, Sam was announced as a 'proper' member of the band just over a year ago and is a hugely talented vocalist and pianist. Above is a performance on Irish TV's Ayala Show, with Sam performing a fairly gripping and emotive love song, I Lost You That Night. There aren't any specific details online as of yet, but he's working on a solo record which is a pretty exciting prospect! Sam's certainly been a busy chap with The Hoosiers recently releasing their fourth studio record, The Secret Service - read my recommendation of the album here. The track is released as part of a double A-side digital single on December 4th, and also features on a split-EP with Berlin-based Burkini Beach, available on cassette via the Famous Friends store here. 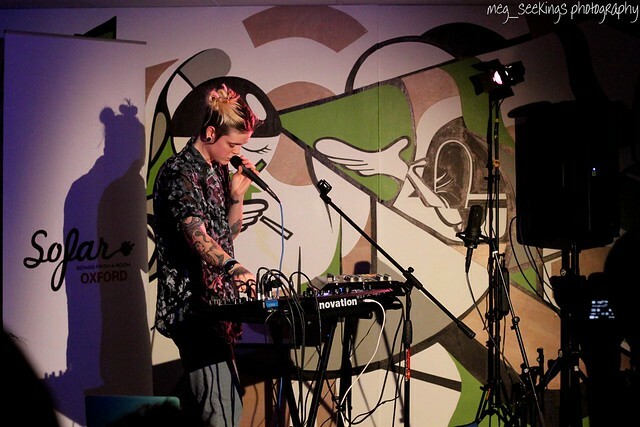 With exams and the Christmas break approaching, I went to my last Sofar Sounds show in Oxford for a couple of months last night. It was at a quirky space run by 3Space, a converted Barclays bank which is now used as office space for charities, start-ups etc. The line-up this time included three local acts I'd previously seen: Esther Joy Lane, Liu Bei (Richard Walters solo set) and Little Brother Eli, alongside London based Lowpines. Jo has made a handy playlist below with a track from each of the acts who all played brilliant sets. 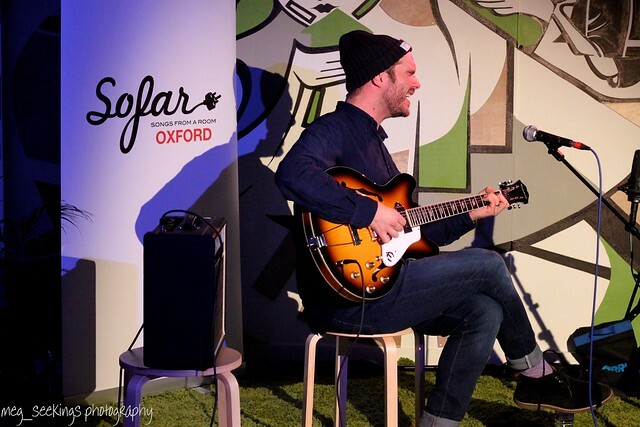 One of my favourite things about Sofar shows is how they can bring together music fans who have come with no idea what they're going to hear, and the line-ups can be pretty varied in terms of genre, but they always seem to come together really well. A particular favourite for me was Liu Bei's Richard Walters, who performed a beautiful solo set and had a great, comical rapport with the audience. Little Brother Eli, who I recently saw play alongside Esther Joy Lane, supporting local band Balloon Ascents, played a more stripped back set, down two members, but frontman Alex retained his charisma and energy, with the band also showcasing some pretty nice harmonies. Esther Joy Lane is creating somewhat of a buzz in the local music scene, with a recent two page feature in Nightshift, Oxford's music magazine. Playing her fairly unique electronic music, in theory, her set should've stuck out like a sore thumb among three acoustic sets, but it worked! Her music isn't what I'd usually listen to, but having seen her twice now, I've enjoyed both sets - take a listen to her track Travelling Light in the playlist below. Opening the night was Lowpines, playing fully unplugged - an idea which he admitted had sounded pretty daunting as he'd miss reverb... but reverb-less guitar aside, and the fact that it was so quiet I felt guilty taking photos, I loved his set, and definitely approved of the cassettes he was selling at the merch stall - very retro. It is weird to think it's been a year since I first contacted the Sofar Oxford guys and started taking photos at the shows, I've seen some great live music in really interesting venues and met a bunch of lovely guys - here's to getting along to more shows in 2016! I'm really happy with the shots I got at the show last night, here are a few of them, and a couple more are up on my Flickr here. As the venue was like a theatre, they had a no phones/photos rule, but the band had told the venue that I was coming to take photos, and I was told I could go in the balcony by myself (rather than lingering near the front, as if people saw me taking photos that would encourage them to take photos too). Sadly, I didn't have a lens that was cut out for shooting at that distance but got a few decent, if a tad unclear, photos - I've put some of the best up on my Flickr here. As the seat I'd been allocated originally was 13 rows back, I was grateful for the superb and clear view that I got of the guys from the balcony, as well as the fact I was up there by myself for most of the set and could sing along to my heart's content! 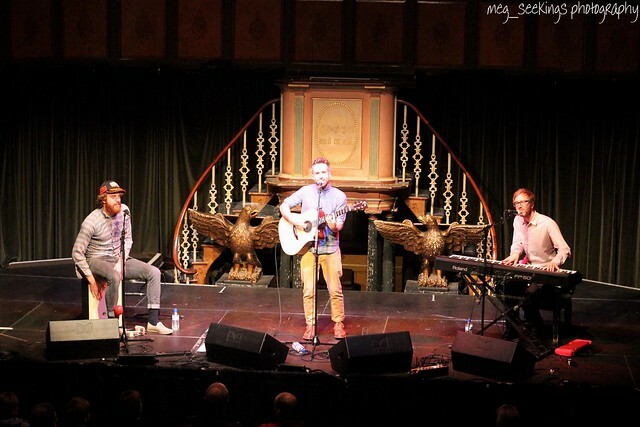 The set itself was stunning, it was certainly worth the wait to see them play acoustically, with them performing a 15 track set including all the hits alongside a few tracks from their latest album, The Secret Service, which they released independently just over a month ago. Being in the balcony also meant I could film some of the set - but of course I made an effort to look beyond my phone and enjoy the performance in the moment, simply filming so I'd have the footage to watch back as tokens of the night. The set was actually fairly emotional, with me really happy to finally be seeing the guys play acoustic coupled with the fact I was surprised with a few tracks I hadn't expected to hear, a few of which made me cry quite a bit... but happy tears! The setlist was a little different to usual shows, with the band playing some tracks that they barely get to in the full band, electric set up. A highlight of the new tracks, for me, was (Don't Make) Eye Contact, the first ever live performance of this acoustic track. This was performed just after first album track, A Sadness Runs Through Him, the first time I've seen them perform this track live, and once again - worth the wait entirely. A little later in the set, they played another first album track which rarely makes it onto the setlist, Money To Be Made, with Irwin unplugging his guitar and stepping in front of the microphone - a truly live, acoustic, and stunning performance. Returning to the stage following a foot stomping demand for an encore from the audience, Irwin took to the stage alone and began to play my favourite song of the band's, Everything Goes Dark. I'd heard the track a couple of years ago performed electrically, then last month on the band's tour, performed acoustic (but naturally there's a difference between a show of this sort and a show where the crowd are rowdy and anxious for the band to play Goodbye Mr A...) With Sam and Al each joining Irwin on stage separately, the performance gradually built up and was, in short, as superb as I could've hoped for. Overall (if you haven't guessed so far!) I had such a brilliant night and I'm feeling really lucky to have been there for this really special evening. As always it was lovely to chat to the guys afterwards, they're genuinely some of the nicest guys I know and I can't encourage you enough to go and take a listen of the latest record, and then buy it, of course, to support independent music. And for the record - it wasn't all doom and gloom with me weeping in the balcony... here's a snippet of the outro to Unlikely Hero, with the audience all clapping along, a lot of fun! For more info on the latest album, The Secret Service, and to purchase it on various formats, look at The Hoosiers official website here. Dry The River today released a new EP, Hooves Of Doubt, as a farewell gift to fans, announcing the news that after seven years, several tours and two albums, they're splitting up and focusing on other projects. 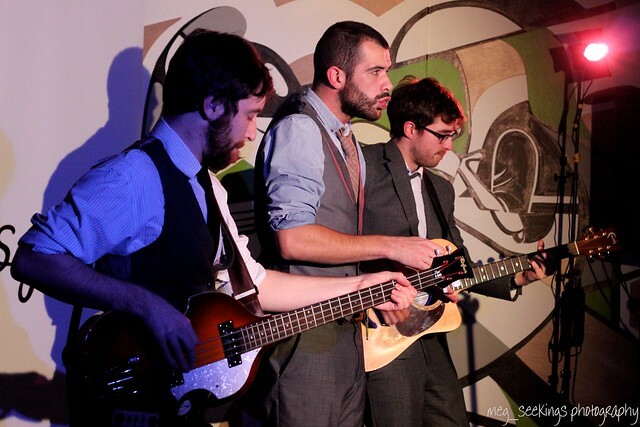 Having been a fan of the band for a few years now, their music has become somewhat of a favourite of mine and in the three shows I was lucky enough to see the guys play, they showcased their brilliance as a live band, striking the folk-rock balance beautifully. While its a little bittersweet to listen to the EP knowing that we won't get to hear the tracks live again, it's as stunning as their two albums (though apart from them, my favourite is probably an acoustic version of their debut, Shallow Bed, which they released online a couple of years ago.) Have a listen and if you haven't heard of them before, do check out their albums because they've got a wonderful back catalogue!